How to easily roast almonds at home with thyme and sea salt. 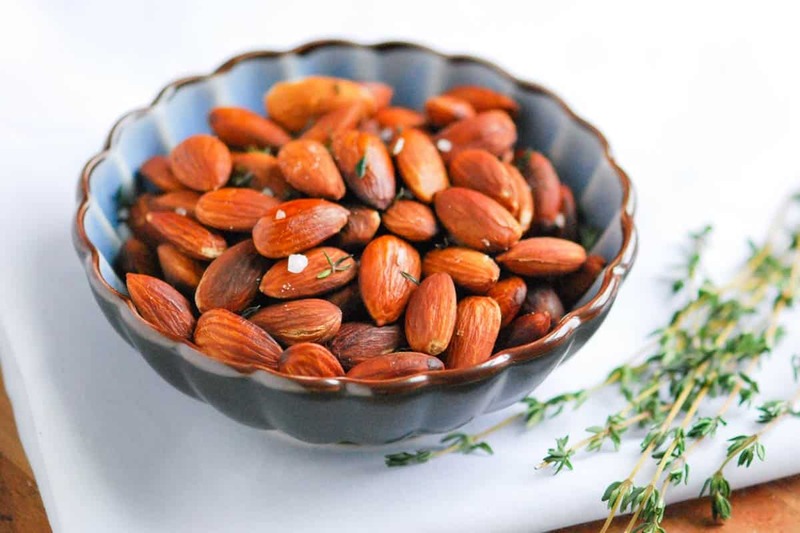 Jump to the Roasted Almonds with Sea Salt and Thyme or read on to see our tips for making them. I know I said roasted, but we actually do not use an oven for this. You could, but we’ve found that toasting the almonds in a skillet on the stove helps the almonds cook evenly and prevents burning. We love fresh thyme with the almonds, but almost any fresh herb will work nicely. You can even make spicy roasted almonds by adding a dried chile or crushed red pepper flakes to the skillet when toasting the nuts. Instead of roasting almonds in the oven, we prefer to toast them in a skillet on the stove. Fresh thyme and sea salt are classic, but you can use any fresh herb. To make these spicy, add a dried chile to the skillet or a pinch of crushed red pepper flakes. In a heavy medium skillet, combine the almonds, olive oil and thyme. Cook over medium-low heat, stirring constantly, until the almonds are fragrant and golden, about 5 minutes. Discard the thyme. 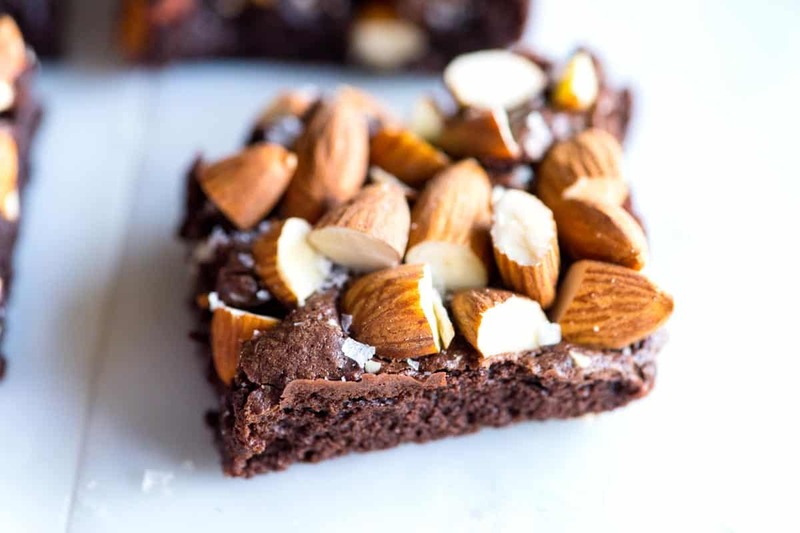 Using a slotted spoon, transfer the almonds to paper towels and pat dry. Add them to a bowl and toss with the sea salt. Serve warm or at room temperature. This recipe also works with blanched almonds — or almonds with the outer skin removed. You can blanch almonds quite easily at home. Pour boiling water over the almonds and allow them to sit in the water for about 1 minute. Drain and rinse with cold water. Pat dry with a towel then slip the skins away and discard. Your little tapas party sounds nice! 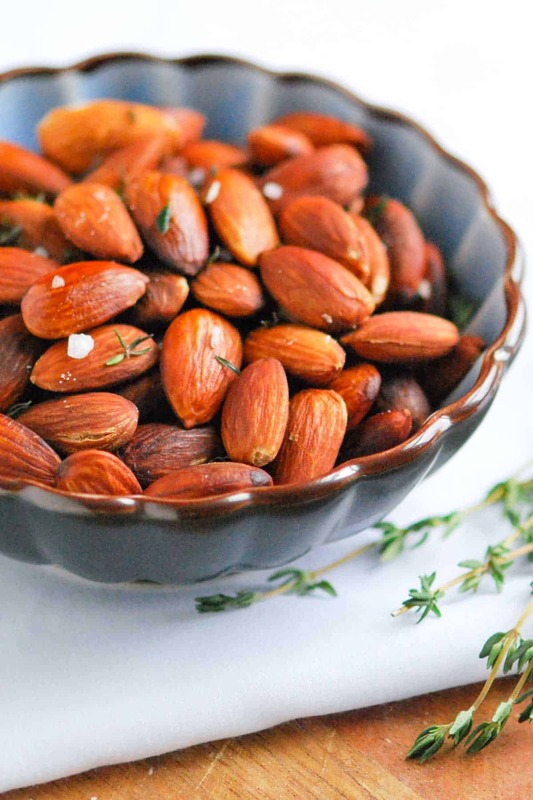 I love the earthy flavor theme of these almonds with the olive oil and thyme! Great combo. I have to try this recipe next time I have a party. Love the idea of a tapas party for two 🙂 My husband and I have wine and cheese nights often and I think we may have to add these nuts to our rotation. 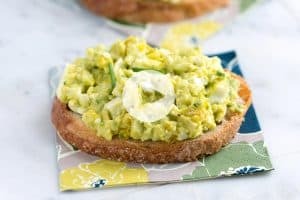 They sound super delicious and it’s great that they are so easy to make. What a great idea for using up leftover thyme! 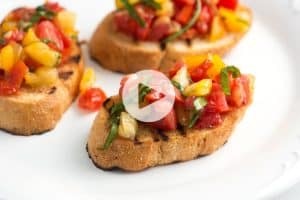 We love doing little tapas-style meals too, especially in the summer when it’s too hot to cook… must remember this recipe for my next one (especially since we have a ton of lemon thyme in the garden right now). Oh Isabelle, we are jealous .. we live in a top-floor condo, with no chance of a garden, so to think of a time when we will, one day, have lots of lemon thyme outside, is wonderful! The nuts really are delicious and are versatile for lots of leftover, or otherwise, herbs.